Liszt’s paraphrases of the major Wagner scenes presented here are more than mere transcriptions. Liszt throws himself heart and soul into giving Wagner’s showpieces voice on the piano… although he is unable at times to resist adding his own virtuoso flashes. When a conductor or composer offers a recital on the piano, it promises to be a special event. 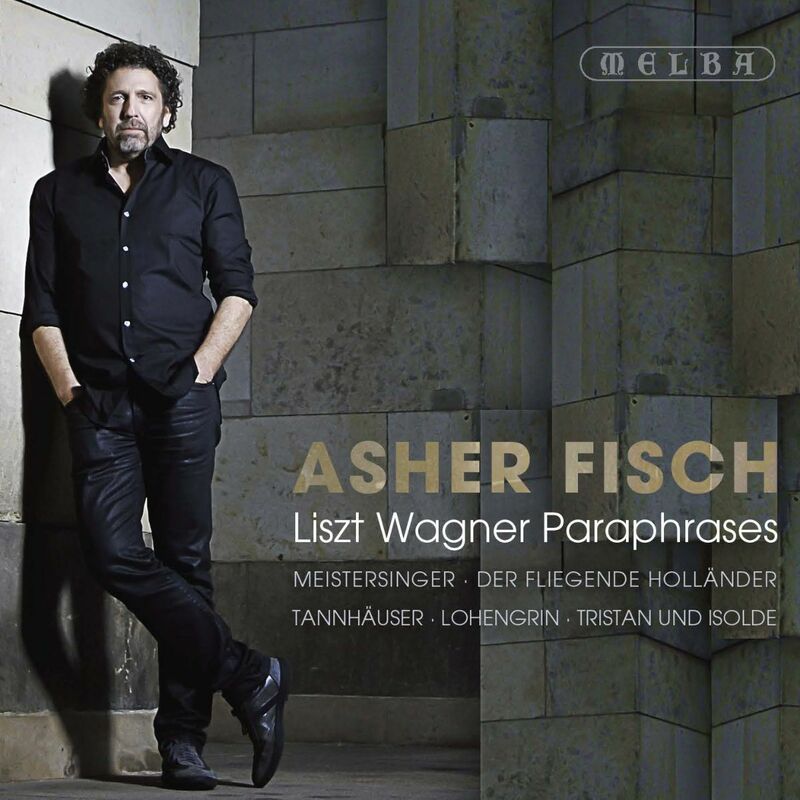 Conductor/pianist Asher Fisch gives poetic readings of Liszt’s Wagner paraphrases developed during a career in the opera houses of Europe, his refined sensibility for balance and space combine with a vocal poise allowing Wagner’s melodies to unfold ineffably and logically. These performances are Asher Fisch’s gift to the listener, deeply satisfying performances suffused with musical insight. Fisch displays a depth of scholarship and understanding of historical context in his performance, uncovering hints of the changing relationship and frissons between the two great men; Liszt’s hinting at the origin of the Tristan chord or later disrespectfully thumbing his nose at Wagner with the addition of scales. Fisch knows where all the bodies are buried in these scores and just how to bring out the detail. Wagner was certainly not regarded as a composer of major works for piano, but the three exquisite miniatures concluding this recording show that away from the opera house and in the right mood he could craft pieces both intimate and personal. 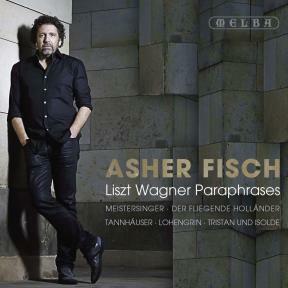 Extravagant praise from France for Asher Fisch’s Liszt Wagner Paraphrases! As a star pianist who travelled widely in Europe, dazzling audiences with his perfect but seemingly impossible virtuosity and romantic composing genius, Franz Liszt was the most famous musician of his age when he took it upon himself to promote the music of an eccentric and little known German opera composer by the name of Richard Wagner. What makes Liszt’s championing of Wagner (then living in exile in Switzerland following a scandalous affair in Dresden) even more remarkable is that he knew only three of his operas: Rienzi, Der fliegende Holländer and Tannhäuser, monumental creations such as Der Ring des Nibelungen and Tristan und Isolde still some years in the future. But Liszt recognised Wagner’s genius and, when he settled in Weimar in 1848, he dedicated his time there, alongside composing and conducting at Court concerts and the city’s theatre (now the Deutsches Nationaltheater), to supporting the work of talented young composers such as Wagner and Hector Berlioz. Liszt was only two years older than Wagner, but given his immense fame and considerable influence, his support for the revolutionary opera composer-in-waiting was crucial. Without it, it is hard to imagine that Wagner would have enjoyed such acknowledgment of his music as he did in his own lifetime. Liszt regularly performed Wagner’s operas in Weimar and persuaded managers of other German theatres to include his works in their repertory and publishers to publish his music. He even lent money on occasion to his chronically underfunded colleague. “My holy Franz!” is how Wagner, who clearly understood the importance of Liszt’s support, addressed his friend and benefactor in one of his letters. Their correspondence deals primarily with the production and distribution of Wagner’s works and very little with Liszt’s own compositions. Indeed, the letters also contain hardly a mention of the piano transcriptions. Nor do we know how Wagner felt about Liszt’s elaborate treatment of his music. For 19th-century pianists, opera transcriptions were an important part of the repertory and were included in almost every piano recital. They were extremely popular with audiences, too, giving them a chance to hear their favourite opera tunes outside of the theatre. They also gave performers an opportunity to show off their virtuosity and for pianists who were also composers, to offer displays of their own improvisatory and compositional skills. Liszt wrote most of his paraphrases for his own recitals, treating the material with complete freedom, embellishing, reharmonising and changing some notes in the original melodies. The most famous example is in the paraphrase on Verdi’s Rigoletto where he changes the original perfect fifth under the word “pene” (‘pain’) in the melody to a tritone – much more befitting the dark and highly romantic musical sentiment. He then builds the harmonic scheme of the rest of the paraphrase on that small change in the main theme in what seems to be utter disrespect for Verdi. He would also deal with operas by Bellini, Donizetti, Gounod, Meyerbeer and even Mozart in a similar manner. In Wagner’s case, the purpose of the transcriptions was different, with Liszt describing them as “modest propaganda on the inadequate piano for the sublime genius of Wagner”. The works included on this recording are taken from the 14 paraphrases that Liszt composed (with varying degrees of fidelity to the originals) on Wagner’s music between the years 1849 and 1871. This is by far the freest transcription of this collection. Closer in spirit to the early paraphrases Liszt composed to operas by Bellini and Donizetti, it is, in fact, an elaborate fantasy on the Act I aria sung by the young Franconian knight, Walther von Stolzing. Rather than opting for what would have undoubtedly been a popular excerpt from the opera – Stolzing’s ‘Prize Song’ from Act III – Liszt chose instead his lesser-known aria from earlier in the opera in which the unknown competitor in the singing tournament tells the suspicious Meister-judges how he learned his vocal artistry: from nature’s sounds and the birds in the forest. Of all of Wagner’s operas, Meistersinger has a unique sound. It breaks away from both his characteristic use of anguished diminished and half-diminished chords and the never-ending modulations so typical of his earlier works, while introducing a fresh, new harmonic scheme based on major and minor seventh chords. Right after the beginning of ‘Am stillen Herd’, Wagner harmonizes the tune with a succession of falling parallel major seventh chords. Played out of context, they seem to anticipate how a jazz pianist might have gone about improvising them a century later, defying all the rules of harmonic progression and voice leading cherished in the 19th century. Liszt is obviously fascinated with this revolutionary passage. He returns to it again and again in the paraphrase, first in its simple form, later embellished with continuous left- and right-hand trills, as if recalling the sound of the singing birds. In a remarkable moment, Liszt modulates to the remote key of D-flat major as the tune is transferred to the lower bass register and the right hand fills out the harmony with rising and falling arpeggios where every low note of each arpeggio takes over one note from the tune in the bass. Utter brilliance! At the return to the main tonality of D major, Liszt starts a long build-up in both volume and speed which culminates in a bravura finale of parallel octaves and fortissimo closing chords. Ironically, this is exactly the kind of empty piano virtuosity against which Wagner fought all his life and he probably would have despised it. However, at this point, when the relationship between the two composers had drifted apart due to a tangled mess of artistic and personal differences (Wagner’s liaison with and subsequent marriage, in 1870, to Liszt’s married daughter Cosima), Liszt seemed not to care anymore about what his new and unwanted son-in-law might make of his re-working. My piano teacher use to say: “Learn Liszt’s transcription to ‘The Spinning Chorus’ from The Flying Dutchman – it is the one example where the transcription is so genial that it surpasses the original.” And indeed, in this work, which sounds throughout like an etude for the piano, Liszt shows his phenomenal understanding of piano technique and compositional genius. It depicts village women sitting at their spinning wheels, singing and dreaming of their loved ones, sailors all, out at sea, when Senta interrupts their reverie by humming the opening calls of a ballad about the fabled Flying Dutchman, doomed forever to sail the wild, lonely oceans in a ghost ship. The spinning stops, beginning again only when the daydreaming workers are chided back to their duties. At the beginning of the transcription we hear how the women try to start their wheels – only at the third attempt, like an old motor engine, do they start turning again. This introduction is Liszt’s own. We then hear the entire scene unfold, left and right hands alternating between the constant sixteenth-triplet-note movement of the spinning wheels and the song. The wheels speed up and slow down, coming to a complete halt when the women drift in their dreams. Senta’s ballad appears twice: the first time the mysterious open fifth “Johohoe!” calls are harmonized simply, as in Wagner’s original. But the second time, towards the end of the piece, Liszt does something quite amazing. He repeats the calls, in D minor this time, and under each of the three repetitions of the call the left hand plays a different dissonant chord of a kind that would have been unheard of at the time of the Dutchman’s composition. The last of these chords is an inversion of the half-diminished ‘Tristan Chord’ which may well be Wagner’s most important contribution to the harmonic vocabulary of the 19th century. This transcription was composed in 1861, two years after the completion of Tristan und Isolde. Perhaps Liszt was paying homage to his then friend’s almost immediately famous chord or he was secretly telling Wagner “You and I both know where the ‘Tristan Chord’ comes from!”(Musicologists strongly believe that the ‘Tristan Chord’ is actually Liszt’s invention and was later plagiarized by Wagner.) The Spinning Chorus draws to an end with a dazzling virtuosic description of the flight of the legendary Dutchman. The well-known chorale that opens the Overture to Tannhäuser is drawn from a very moving scene in the Act III, in which Elisabeth anxiously awaits the return of the pilgrims from Rome, not knowing if her beloved Tannhäuser has been pardoned for his sins by the Pope and is able to return home. She suddenly hears their a cappella singing from far off stage. As they come nearer, the orchestra gradually joins in and, after a short but powerful crescendo, the pilgrims are on stage and the tune is repeated in all its glory in fortissimo, accompanied by the familiar falling triplets figure from the Overture. Looking in vain for Tannhäuser, Elisabeth is left heartbroken and alone as the pilgrims continue their journey through the valley until their singing fades away in the distance. As in most cases, Wagner did not supply an appropriate concert ending to the section so Liszt was compelled to create something of his own. He added 16 bars in which the unharmonized chorale melody is played in octaves in the lowest register of the piano, almost like the baleful tolling of far-off church bells. Eerie chords in the right hand halt the tune a few times – indications of Elisabeth’s sadness, no doubt – and the piece closes with three diminuendo E major chords in the top register. It is interesting that Liszt, in a footnote on the score, suggested that his addition may be omitted and the performer can skip directly from the chorale’s end to the last three bars. Yet it is exactly this kind of intensely personal interpolation that makes these transcriptions so fascinating in their own right, raising them from being mere piano reductions to works of art themselves. Perhaps the most difficult operatic element to transcribe to the piano is the accompanied recitative where many notes tend to be repeated in the sung line in order to accommodate the text at hand. Usually there is hardly a tune to speak of and often the solo line mimics speech rather than song. This is all very non-pianistic. Liszt, however, not only includes the entire recitative preceding ‘O du, mein holder Abendstern’ in this transcription, he also introduces recitative passages in his own piano material. (In his early Piano Fantasia in F-sharp minor Wagner himself had included, albeit somewhat clumsily, recitatives.) In the ‘Song to the Evening Star’ transcription Liszt offers the pianist the option to skip directly to the beginning of the song. The first part of the recitative appears in the baritone register (appropriately so, given it is sung by Wolfram) before arpeggios in the harp and sustained brass chords are added under and above the singing line. Things get more complicated when the strings enter in a very high, hushed tremolo. A tremolo, by definition, should sound uneven and irregular – a very difficult effect to achieve on the piano. Liszt solves the problem by transferring the tune to the soprano register, close to the shimmering tremolando. When we get to the central theme in all its diaphanous beauty, Liszt, in a bold chord succession, modulates to the key of A-flat major and remains in this tonality to the end of the work. The reason for this puzzling transposition of Wagner’s original is probably pianistic: it is much easier to play the expressive melody against the enveloping harp accompaniment when it is played mostly on the black keys of the piano. This is a Grand March that lives gloriously up to its name, but, for any Tannhäuser conductor, the beginning of the ‘Entry of the Guests’ march in Act II is both a moment of great joy and sheer panic. Joy, since this is one of the most exhilarating pieces of music in all opera; and panic, given that the prospect of surviving without major mishap the twin nightmares of co-ordinating both the on-stage and pit trumpets, and a chorus obliged to sing while they are marching with the orchestra, are less than slim. Add to that intonation issues with the trumpets in B, and the fast string triplets in the very uncomfortable key of B major, the reason this magnificent entry scene is often unsatisfactory in performance becomes all too evident. Wagner’s tempo indication to the march is a very quick 72 beats per minute for the half-bar. Choosing the half-note (minim) for the tempo indication means that Wagner wished it to be conducted in two beats to the bar. However the considerable coordination challenges and technical difficulties have caused the tempo of the march to become slower in performance over the years and especially when conducted in four, it loses much of its incredible momentum and energy. Liszt, who had conducted Tannhäuser many times and knew the work intimately, was obviously aware of the march’s many difficulties. In transcribing it to the piano he created the circumstances for a perfect rendition – in the correct tempo – by pulling out all the stops to exult in displays of thrilling pianistic virtuosity set against grand orchestral sonority. Liszt remains loyal to Wagner’s original score throughout the first section of the march. In the middle, slower section, however, he adds embellishments in the right hand in the form of quintessentially romantic salon-music fioratura (again of the kind that, in all likelihood, would have horrified Wagner). At its conclusion, there are the parallel octave runs, broken fortissimo chords and an almost unplayable descending scale in F-sharp major alternating between both hands (the free hand taking over the part of the on-stage trumpets) that one might well expect of the pyrotechnicallyinclined Liszt. For the transcription of ‘Elsa’s Bridal Procession’ from Lohengrin – another opera that Liszt helped to promote, conducting early performances in Weimar – Liszt finds a simple but brilliant solution for a suitable concert beginning and end by seamlessly framing the slow procession music within the opening and closing bars of Wagner’s Prelude to the opera. Starting with open fifth A-major chords quickly followed by the ‘Grail motif’, he then transposes the sequence one half-step higher to B-flat major and thus elegantly prepares for the modulation to E-flat major, the main tonality of the scene. The ‘Bridal Procession’ music is then played as in Wagner’s original score. For the conclusion, Liszt modulates back to A major, picking up music from the Prelude again (from the wonderful tranquillo section towards its end) before the ‘Grail motif’ brings proceedings to an end. Liszt’s modulations and the transitions between the two quotations are so characteristic of Wagner’s own compositional technique that the result sounds as if it had been composed by Wagner himself. The description “Liebestod” – which became the virtual title of Isolde’s fateful final scene from Tristan und Isolde – was coined by Liszt, who first used it in the title for this transcription. Early sketches for the opening of the transcription reveal that Liszt had worked hard to find a suitable introduction to be heard before the soprano’s first hushed phrase, doubled by bass clarinet, “Mild und leise” (‘Softly and gently’). He found what he was looking for in the accompanying music to the big love duet of Act II, ‘Liebeheiligstes Leben’ (‘Life of love most sacred’). Other than this short introduction, the rest of the transcription is the closest to Wagner’s original of all of Liszt’s paraphrases. In fact, except for one altered note in the bass towards the end of the piece, Liszt does not change anything from the source. The one altered note – an F sharp in Liszt’s version instead of Wagner’s D sharp – could have been a type setting mistake or an indication that Liszt believed it was Wagner who had made a mistake. In any case, it is of negligible importance since both notes are part of the B major chord at hand and do not change the harmony. It is even more fascinating to see how Liszt can transcribe this heavily vocal/orchestral moment without adding any of his own compositional remarks in the form of embellishments, modulations etc. One wonderful example from the beginning of the piece shows Liszt’s understanding of how to use the limiting world of the pianoforte sound and how to create a feeling of orchestral space by misplacing the registers of the original tune. As noted above, the Liebestod begins with a pianissimo two-bar phrase sung in the lower soprano range, in the first octave above the middle C, by Isolde to the words “Mild und leise”. It is doubled, two octaves lower, by a bass clarinet, again in pianissimo. The strings supply the shimmering tremolo, supporting the melody harmonically. Rather than transcribing the tune on the piano in the soprano range, Liszt has it played in the lower, bass clarinet register. The left hand plays the tremolando and an appropriate atmosphere is achieved for the opening bars. However, as the melody progresses, Liszt slowly introduces the soprano’s register in the right hand and when he reaches the climax of the first phrase – the high A flat sung to the word “leuchtet” (‘shines’) – we have reached a high point of a phrase transcription is the closest to Wagner’s original of all of Liszt’s paraphrases. In fact, except for one altered note in the bass towards the end of the piece, Liszt does not change anything from the source. The one altered note – an F sharp in Liszt’s version instead of Wagner’s D sharp – could have been a type setting mistake or an indication that Liszt believed it was Wagner who had made a mistake. In any case, it is of negligible importance since both notes are part of the B major chord at hand and do not change the harmony. It is even more fascinating to see how Liszt can transcribe this heavily vocal/orchestral moment without adding any of his own compositional remarks in the form of embellishments, modulations etc. One wonderful example from the beginning of the piece shows Liszt’s understanding of how to use the limiting world of the pianoforte sound and how to create a feeling of orchestral space by misplacing the registers of the original tune. As noted above, the Liebestod begins with a pianissimo two-bar phrase sung in the lower soprano range, in the first octave above the middle C, by Isolde to the words “Mild und leise”. It is doubled, two octaves lower, by a bass clarinet, again in pianissimo. The strings supply the shimmering tremolo, supporting the melody harmonically. Rather than transcribing the tune on the piano in the soprano range, Liszt has it played in the lower, bass clarinet register. The left hand plays the tremolando and an appropriate atmosphere is achieved for the opening bars. However, as the melody progresses, Liszt slowly introduces the soprano’s register in the right hand and when he reaches the climax of the first phrase – the high A flat sung to the word “leuchtet” (‘shines’) – we have reached a high point of a phrase that spans over four octaves, rather than only two. The effect is altogether tremendous. Also, towards the end of the piece, at the big orchestral climax, Liszt uses all of the piano registers to achieve both the volume and the sense of space created by a large orchestra playing in the pit, in a manner that only a pianist who had also actually conducted this type of orchestral passage could possibly have. Wagner admitted that he never properly studied how to play the piano and that his piano playing as a result was rather weak. He did, however, compose some piano works early in his career; a Sonata and an elaborate Fantasia with numerous recitatives are two that particularly stand out. Two of the three shorter piano pieces on this recording were composed as musical presents for friends. The Albumblatt für Frau Betty Schott was composed in 1875 and dedicated to the wife of his new publisher, Franz Schott (from the famous Schott Verlag, who continues to be Wagner’s publisher today). It is reminiscent of his only orchestral work from this period, the symphonic poem Siegfried Idyll, a present for his wife Cosima on the birth of their son Siegfried, which has some harmonic and motivic affinity to Die Meistersinger von Nürnberg. The last work, Albumblatt ‘in das Album der Fürstin M.’, was also composed in 1861. It was dedicated to Princess Pauline von Metternich, a famous Viennese socialite and wife of the Habsburg ambassador to Paris, who had been instrumental in organizing the first production of Tannhäuser in Paris that same year. *** The Tristan chord is an inversion of the half diminished chord, made of a perfect fourth superimposed over a tritone interval. The beauty of the chord lies in its ambiguity. It could be solved harmonically in many different ways, and the tension it creates served Wagner to express longing, endlessness, the unknown.